Dine like royalty with this beautifully crafted bar chair. 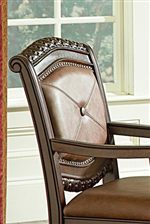 A round swivel seat features chocolate brown leather-like upholstery for sophisticated appeal with comfort. Detailed wood trim creates a bold, traditional style. Finished with thick, gently curved legs and a round footrest, this barstool ensures high quality support for years to come. 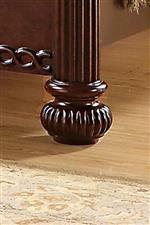 Pair with the matching pedestal pub table for the complete look. The Antoinette Traditional Rich Brown Swivel Barstool by Steve Silver at Walker's Furniture in the Spokane, Kennewick, Tri-Cities, Wenatchee, Coeur D’Alene, Yakima, Walla Walla, Umatilla, Moses Lake area. Product availability may vary. Contact us for the most current availability on this product.